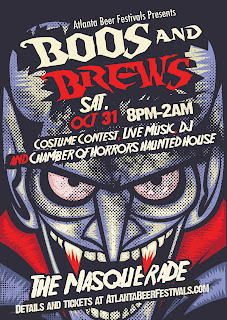 Halloween Jams: Throw down with Outkast’s Big Boi tonight! Here is something off the chain to enjoy tonight in the ATL! I mean come on, if you don’t think Big Boi knows how to party with his stellar career as one half of Atlanta’s beloved Outkast, then who does?! Here’s the scoop of his Halloween bash at Stankonia tonight straight from the source. Just be safe and watch out for zombies! Big Boi’s Dungeon Party is about to go down! 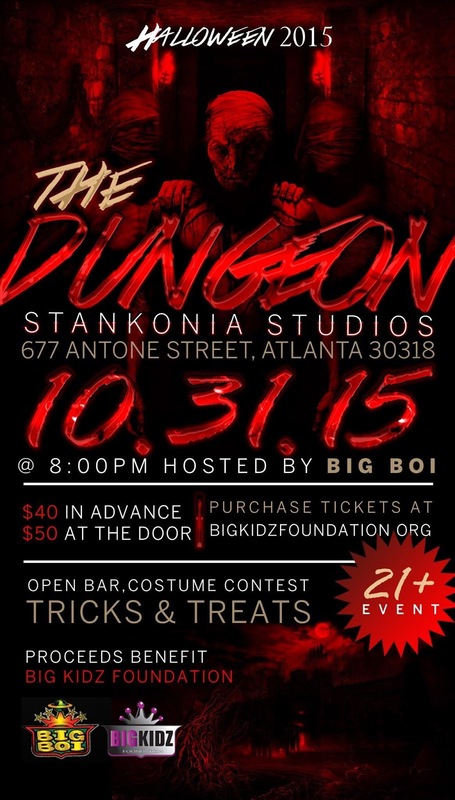 After a two-year hiatus, Big Boi hosts the ‘Dungeon Party’ at legendary Stankonia Studios to support his wondrous charity, the Big Kidz foundation tonight! 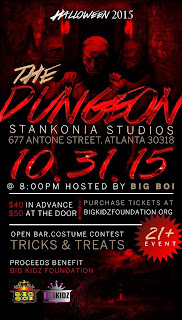 WHAT: Multi-Platinum Hip Hop Artist Antwan “Big Boi” Patton one-half of the Grammy-winning duo Outkast will host the highly anticipated Costume party themed “The Dungeon Party”. 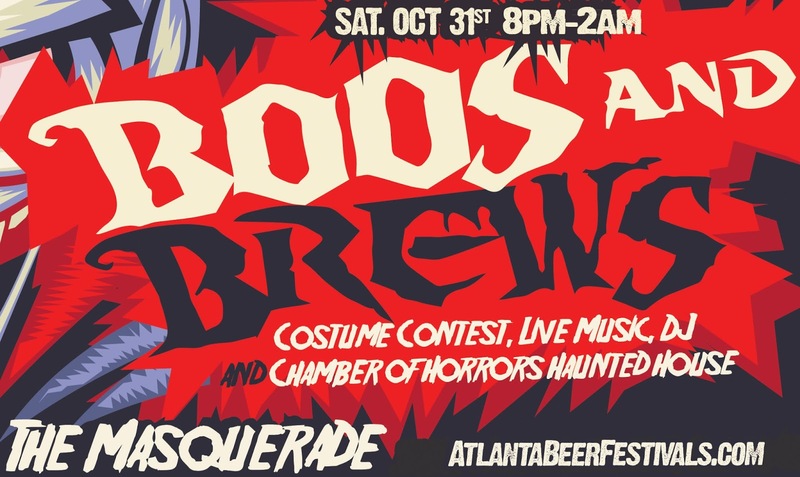 This hot ticket event has become a tradition among Atlantan’s who love a good party as they dress up as their favorite superhero, celebrity, ghoul and goblin. Guests can expect to enjoy a tasty menu from T.I.’s restaurant Scales 925, three open bars, a chance to win up to $500.00 in cash and prizes and a surprise performance by Big Boi. 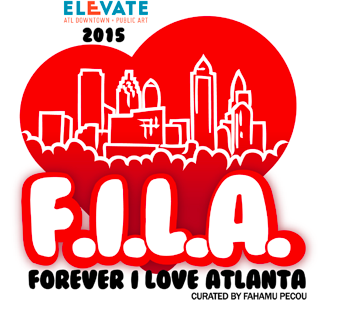 WHO: Big Boi and many of his celebrity friends, business leaders and Atlanta’s Socialites will be in attendance. Every Guest is a VIP! WHEN: Saturday, October 31, 2015, Doors Open at 9 p.m. Media Interviews with Antwan “Big Boi” Patton will be held promptly at 11 p.m. All Media must confirm attendance prior to event, by email: media@bigkidzfoundation.org or contact Media Director, Jessica Manning 404.313.7602. HOW: General admission tickets can be purchased at www.bigkidzfoundation.org or by calling 404.287.8556. 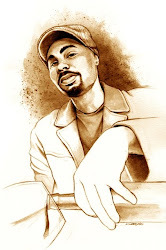 This fundraiser was created to help the Big Kidz Foundation provide programs that create cultural exposure through music, art and literature. It is the mission of the Big Kidz Foundation to help develop well-rounded youth in underserved communities. 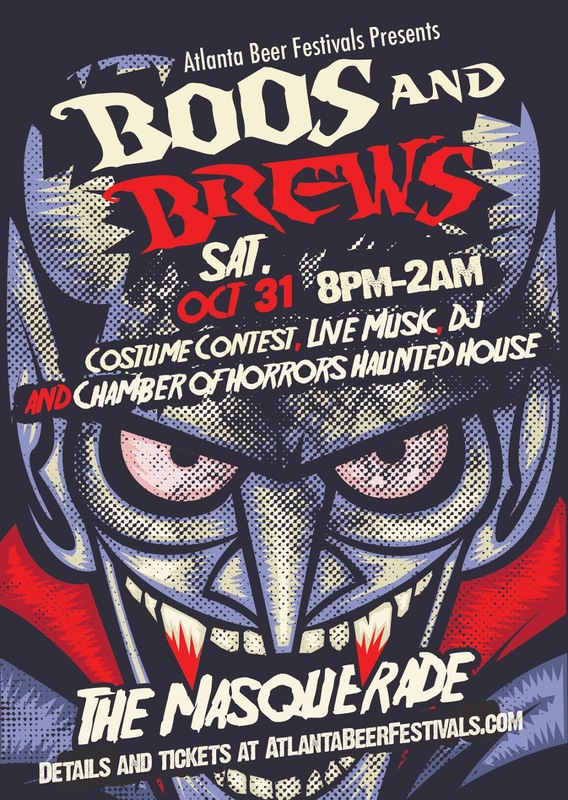 Boos and Brews at Masquerade for Halloween! 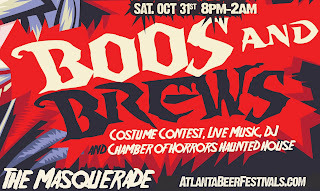 On Saturday, October 31st, 8 pm-2 am, Atlanta Beer Festivals throws down once again! Anyway, look for more coming soon here, on Twitter (@alesharpton). This Thursday, Network with Speakeasy, Lagunitas, Cigars and Eats! Straight to the point: NY Prime bites. Lagunitas brews. Water Wheel cigars. Speakeasy hosting. Want to chill out on a balcony in Buckhead and make a few contacts in the process? Check out this Speakeasy event this Thursday, October 29th from 6 to 9 pm. Here’s their promo video from last year’s anniversary party to get an idea on how they get down: Speakeasy Anniversary Party. The next one is December 4th. 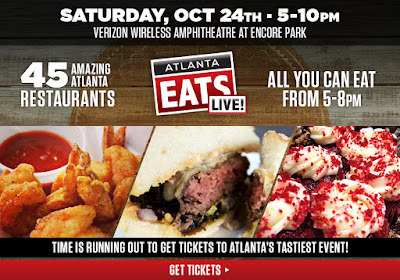 Atlanta Eats Live is this Saturday! I can't wait for this one! 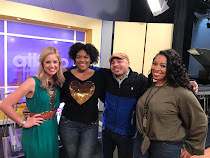 I already have love for Atlanta Eats' show and the feeling is seemingly mutual because they had me on as a guest for the TV version and on their radio program. Anyway, they have a few tickets left here so if you want to get your grub on while jammin' to live music and support a great cause, this is the ultimate date. Here's the skinny below. See ya there! 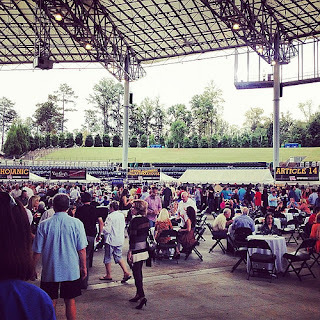 On October 24th, 2015 from 5-10 pm, Verizon Wireless Amphitheatre, a venue that houses the likes of musical acts from the Rolling Stones to Tony Bennett, will again play host to our event: “Atlanta Eats Live.” What does that mean? 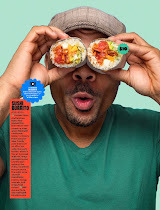 It means LIVE music, LIVE cooking demos, and LIVE rock star chefs. Attendees will eat and drink from 40 handpicked restaurants and enjoy great live & local music. Building on the success of the last 2 years, we’re anticipating an even bigger audience and tweaking the flow of the event to make it even better. Previously held on a Sunday evening, our guests asked for a big Saturday night out and we listened! Amazing food will be served by our favorite restaurants with live bands playing on stage, and tasty drinks served throughout. The event will again directly benefit the restaurant community- with a portion of the proceeds going to The Giving Kitchen charity. Taco Mac Goes Loco for Locals During Beer Week! 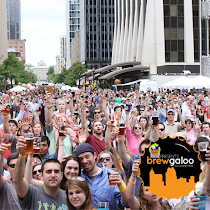 Peep this list of specialty brews being poured this week all over ATL! At participating Taco Macs listed in the digital flyer above, Monday Night, Reformation, Jailhouse, Red Hare, Jekyll, SweetWater, Cheery Street, O'Dempsey's, Wild Heaven, and Red Brick are all providing some seriously gangster specialty brews for all of Georgia to enjoy. I am going to be hitting up different Taco Mac locations as their official correspondent complete with an Instagram and Tweet of the featured brews. 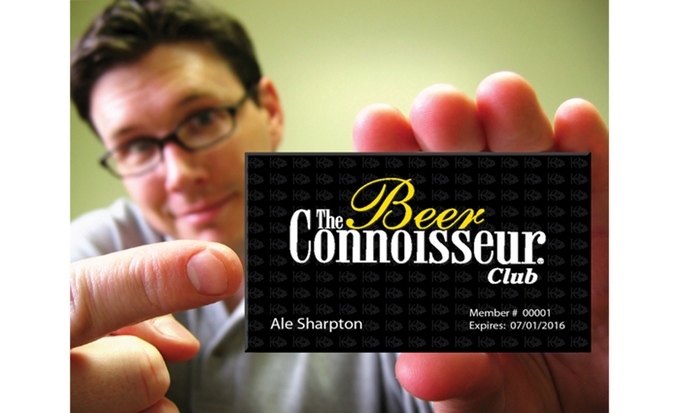 Look for the (#CruisinForABrewsinTacoMac hastag.) I can't wait to try 'em. They even added a little New York love by pouring some Southern Tier joints as well. Anyway, look out for these TMac events and hell, grab some of their world renowned wings while you're at it! 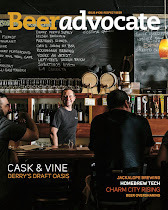 That's Adam, the Taco Mac shotcaller on the left doing the "Ale Sharpton" with a Monday Night barrel aged Drafty Kilt in his hand straight from the brewery's tank. 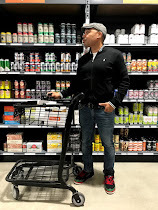 He is responsible for all the liquid goodies we are about to indulge in so if you see him, give him dap and say thanks! Oh, and look out for their new website coming in December too! See y'all with a local beer in hand near you! 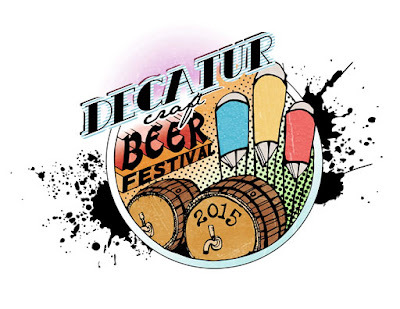 October is Stacked For Beer, Food and Art! This week-long art explosion by the City of Atlanta (featuring my company AllWays Open and artist Brandon Sadler) kicks off Thursday through next week throughout Atlanta! Check out these awesome posters for things poppin' off during the 10th month! 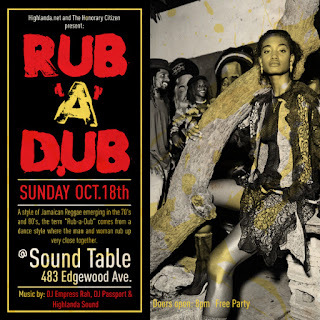 October continues to bring the heat while the weather cools down and I wanted to post a few cool art posters informing us of the numerous events going down starting Thursday with Elevate Atlanta and Bone Lick's Pop Up in the Music Room along Edgewood Ave. in Old Fourth Ward. Of course, there is ash*tload more including New Belgium and Three Tavern's collaboration before the Decatur Beer Fest, a new brunch menu at Ormsby's beginning on Saturday, reggae sounds at Sound Table on Sunday, and then Atlanta Beer Week kicks in thanks to Taco Mac's help keeping it relevant for starters. I will be adding more updates to keep you, my cherished followers, in the loop, but for now, enjoy these awesome posters which include the info to what's poppin' around town! And unbelievably, there is more to come! October is crazy in ATL and today’s events prove it! Besides my b-day (A-hem! ), check out some of the gangster events poppin’ off during the tenth month! 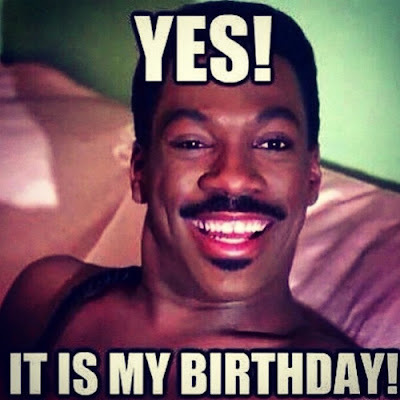 I appreciate all your birthday wishes first and foremost. Shout out to Steph Curry’s daughter because I truly do feel blessed. Anyway, Atlanta is going to be off the meter from tonight going forward and I want to share the news with my favorite people—YOU! 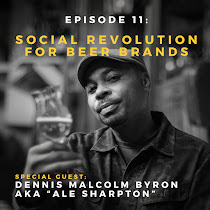 From Three Taverns launching their first lacto-fermented sour beer at their brewery, to STK hosting the The Veuve Clicquot En Route Truck, a documentary premier at Sound Table by my dude Bobbito and Stretch Armstrong, Venkman’s hosting free music nights, and a beer dinner at Reformation for starters. And as for the weekend, forget it! BET Weekend including Future’s party (also on the sidebar), Party At Ponce’s bash (see the sidebar), ATL Pride events, A3C… CRAZY! Regardless how effed up traffic is going to be, it’s worth it! I am going the lazy route and just posting the media release versions for the events, but I have an excuse: It’s my birthday! Have a good weekend and thanks for the love! Three Taverns Launches New Sour: Asylum #1! 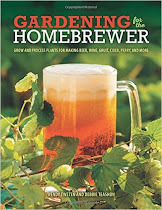 Looking for an alternative to the onslaught of pumpkin beers this October? Then join us this Thursday night at the brewery when we launch the first in our new series of lacto-fermented sour beers. Sour Asylum #1 is a light, pleasantly acidic, 3.8% sour session beer brewed with 100% pilsner malt, soured with lactobacillus in the kettle, fermented with our house lager yeast and dry hopped with Amarillo and Galaxy. 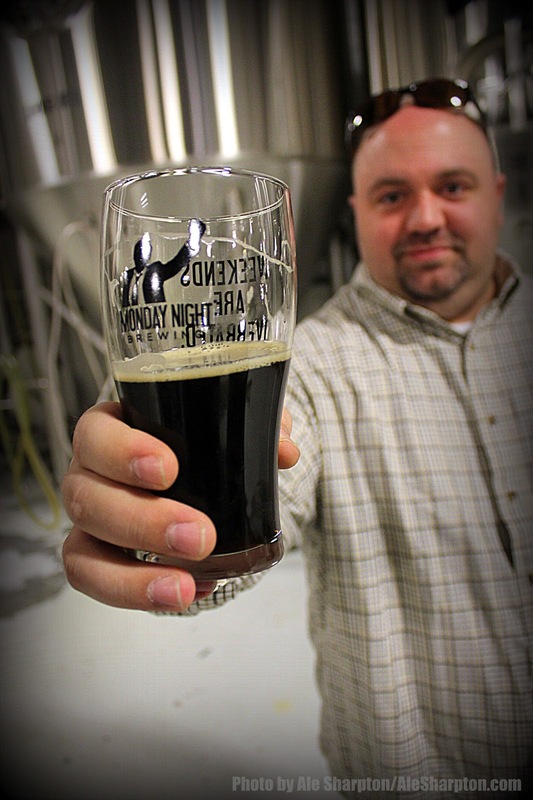 While the “new” DOR regulations may be stopping our standard beer-to-go tours, special event tours are still in play. This unique tour will be $25 and includes a special facility tour with details on the souring process, tastings in The Parlour of up to 36oz., live music, and a Three Taverns glass growler with a 64oz. souvenir fill of Sour Asylum #1. This will be the only tour option for the evening. Early reviews of Sour Asylum were solid this past Saturday at the GCBF where the keg tapped out early. This is the first of what will be an ongoing series of experimental draft-only lacto-fermented sours, with a new one launching every 4-6 weeks. Expect to see Sour Asylum #2 in early November with a decidedly Thanksgiving theme. 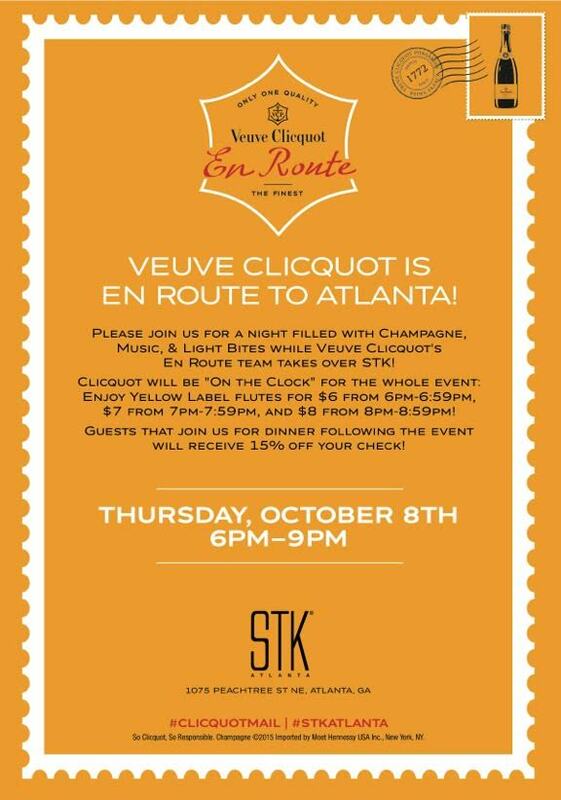 The Veuve Clicquot En Route Truck Heads To STK Atlanta Tonight! 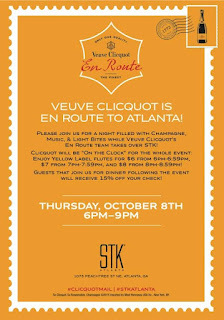 Adorned in Veuve Clicquot’s iconic yellow hue, the Clicquot En Route truck is making its way around the country and will be stopping at STK Atlanta on Thursday, October 8, 2015 from 6 p.m. to 9 p.m. Guests are invited to enjoy an exciting, champagne-infused evening featuring a DJ, photo booth, calligrapher, games, giveaways, and gourmet bites created by STK’s Executive Chef Mark Alba. Each hour “Veuve on the Clock” specials will be announced, offering guests a chance to partake in a variety of champagne specials. From 6 p.m. to 6:59 p.m., champagne lovers can indulge in Veuve Clicquot Yellow Label and Non-Vintage Rosé for just $6; from 7 p.m. to 7:59 p.m., the price rises to $7 and so on until the clock strikes 9 p.m. Those party goers that stay for dinner will receive 15% off their check and also have the opportunity to purchase a magnum bottle of Veuve Clicquot Yellow Label for $150. Finally, in anticipation of the Clicquot En Route truck’s arrival, STK will be serving a glass of Veuve Clicquot Yellow Label or Non-Vintage Rosé paired with STK’s signature truffle fries out of custom Veuve Clicquot mini-mailboxes, available for $19, the entire week leading up to the event. To make a reservation or to learn more, visit www.stkhouse.com. When: Thursday, October 8, 2015, 6 p.m. to 9 p.m. Since its creation in 1772, Veuve Clicquot played an instrumental role in establishing and evolving the champagne industry as we know it today. Located in Reims, France, Veuve Clicquot prides itself on using only the most distinct grapes reflecting Madame Clicquot’s motto “only one quality, the finest.” Now, more than 200 years later, Veuve Clicquot Champagne inspires the world to “Be Clicquot”: modern, audacious and premium quality. These values, set forth by the ground-breaking and extraordinary Madame Clicquot and maintained by generations of Clicquot drinkers, promise a remarkable experience with each sip of Veuve Clicquot Champagne. For more information, please visit Veuve Clicquot on Tumblr www.veuveclicquot.tumblr.com or www.veuve-clicquot.com. The Atlanta Premiere of this exceptional documentary will take place on Thursday, October 8 at the Sound Table (Space2), featuring a live Q&A session with Bobbito & Stretch immediately following the film. Here is the link. 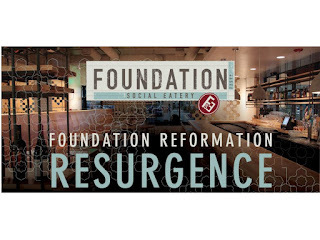 On Thursday, Oct. 8 from 7 to 9 p.m., diners at Foundation Social Eatery are in for a special treat with beer flights available from Reformation Brewery and live music on the patio from Kyle Vincent. 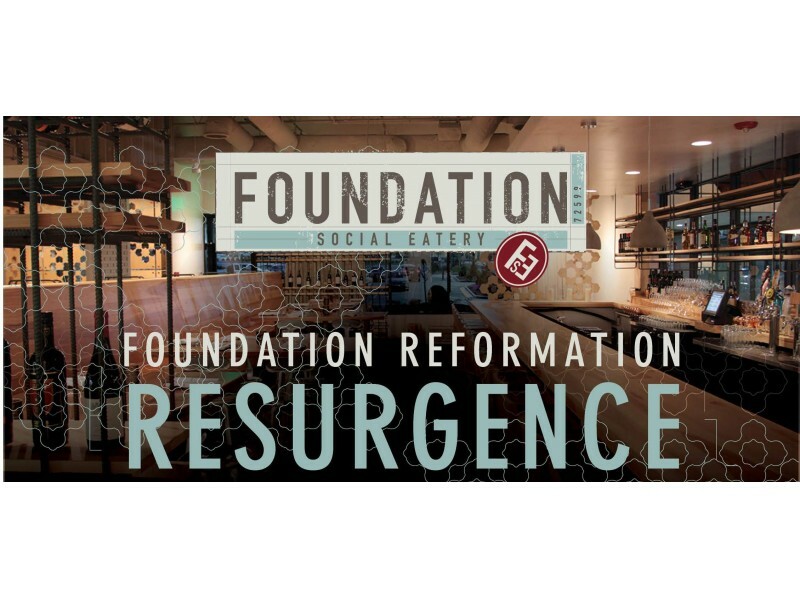 For more information on this Foundation Reformation Resurgence, call 770.641.8877, visit www.FoundationAtl.com or like the Facebook page. Venkman’s, Atlanta’s hotly anticipated dining and live music concept from Yacht Rock Revue front men Nicholas Niespodziani and Peter Olson, will have free live music every night through October 28. Venkman’s music lineup includes all genres, from bluegrass to funk, and ramps up in energy and volume throughout the week. 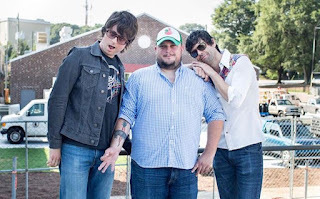 Chef Nick Melvin, who has earned acclaim in local kitchens and as the founder of Doux South Pickles, has created a stacked menu full of creative takes on classic comfort food, which guests can enjoy before the music or when they take a break from dancing. Venkman’s favorites include the Smoked Trout Beignets with celery slaw and apple ketchup, as well as the Cast Iron Fried Chicken with charred radish and turnip salad. Be sure to grab a delicious concoction from Bartender Bradford Tolleson, like the soon-to-be-famous Ecto-Cooler cocktail, before you tear up the dance floor. Venkman’s doors open at 5 p.m. and food service begins at 5:30 p.m. The kitchen is open from 5:30 until 10 p.m. Sunday through Thursday, and 5:30 until 11:00 p.m. Friday and Saturday. Venkman’s also offers a late night menu for one hour after the kitchen closes. For a full schedule and show times, visit ticketfly.com. For more information, visit venkmans.com or call (470) 225- 6162. The 8-man Schooner specializes in the smooth sounds of the late '70s and early '80s. 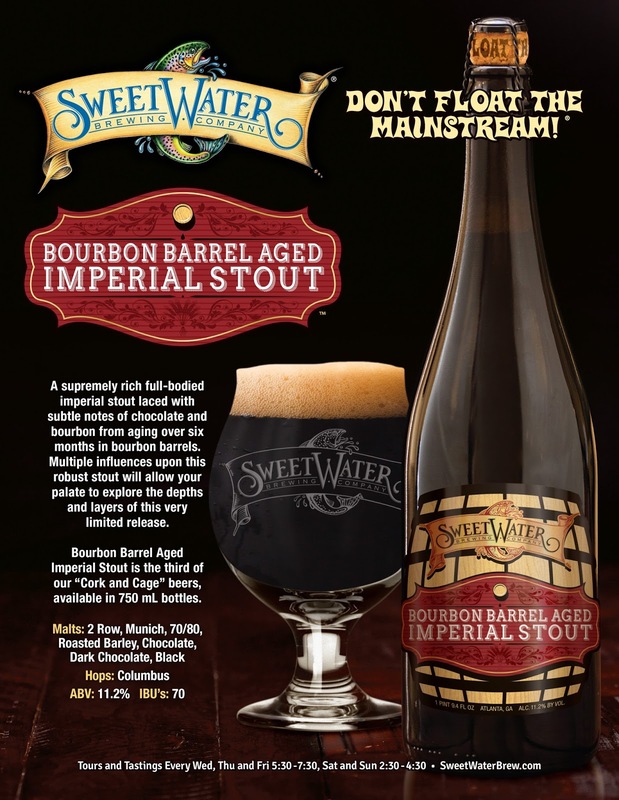 Sweetwater Brewing Pours Their Bourbon Barrel Aged Imperial Stout Today! The launch party is today and the 750 ml Cork & Cage bottle hits the stores on Monday, October 5th! 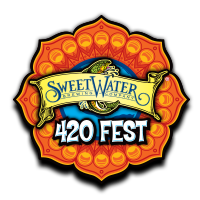 SweetWater has been going extra hard this year with all of their expansion to more states up north and the launch of the Cork & Cage series—potent, experimental small-batch brews topped with yes, a cork and cage. The first Cork & Cage joint. The first release of this series was the excellent peach-infused The Pit & The Pendulum Wild Ale; this time around, my constant wishes of them making a bourbon barrel-aged imperial stout being realized. This silky smooth sipper at 11.2% ABV is a good one! I had a taste last week during a private media preview. 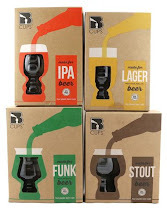 Now we can actually bring a bottle home on Monday, October 6th. 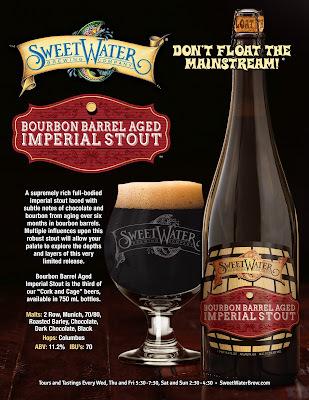 To confirm my praises, come through to the brewery today starting at 1 p.m. SweetWater says, “The Bourbon Barrel Aged Imperial Stout is a supremely rich, full-bodied imperial stout laced with subtle notes of chocolate and bourbon, acquired while aging in bourbon barrels.” I concur. Speaking more on the release party at the brewery, the first 100 early birds get a limited edition Bourbon Barrel Aged Imperial Stout snifter, plus there will be a S’mores bar and yes, the Atlanta Falcons game will be on. The admission including a tour and tasting tickets is a measly $10 a person! 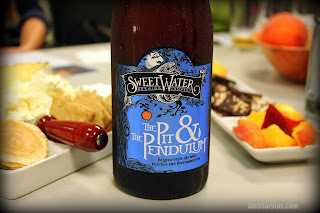 For more info, visit www.sweetwaterbrew.com.